I will definitely do a numbers post on these two extremely prolific batsmen, but that will have to wait till the three tests against the West Indies are over. There will be a few more records and much else to celebrate then - Pakistan's first 10K in tests, Pakistan's first 4K as Test captain, and quite possibly Pakistan's first 35th test ton. Numbers however, will only tell half the story in the case of these two stalwarts. Their services to Pakistan's test cricket over the past decade are incomparable. Both Younis Khan and Misbah Ul Haq will be missed immensely, not only for the runs they produce in the middle, but more so for their respective contributions off the field, in the dressing room, and on the other players. He is Pakistan's very own King Khan. Besides claiming every single test batting record there is to claim for Pakistan, Younis has had an impact like no other on an entire generation of batsmen. He has been a major guiding force for many young batsmen, an instrumental contributor to the success of these batsmen, and a true role model that the likes of Azhar Ali, Asad Shafiq, Ahmed Shehzad, Shan Masood all look up to. Younis has built partnerships with each one of the above mentioned batsmen that have taken Pakistan to great achievements. There is a reason why no one else from Pakistan has been a part of as many century partnerships in tests than Younis Khan has. He scores runs himself and he enables his partner to accumulate plenty of runs as well. Each of Azhar Ali, Shan Masood, Asad Shafiq, Fawad Alam, and Umar Akmal will tell you a story about how Younis Khan helped them reach their first test hundred. Many others will tell you how easy Younis makes it for his partners while he is at the crease. Pakistan's coaches will tell you how hardworking and dedicated Younis Khan is. Pakistan's test captains will tell you the impact Younis Khan has on the dressing room. It is these things that cannot be measured by numbers that Younis Khan will be mostly remembered for. From taking on the reigns of Pakistan's test team in 2010 following the spot fixing scandal to breaking all the captaincy records there are to break for Pakistan, Misbah Ul Haq has been an exceptional leader. He has taken Pakistan's test cricket to heights never witnessed before. He took the team out of turmoil, instilled belief and confidence in them, developed a culture like never before, and achieved unprecedented results. Misbah's achievements as a leader in whites are incomparable. Never has Pakistan's test cricket seen such continuity in selection and such stability in a batting order over 6-7 years; credit for all of this is to Misbah who has led these men with aplomb. Enabled by Misbah, the team has broken records, the batsmen have broken records, and Misbah himself has broken records. Such is the greatness of this test team that the records they have established since 2010 will probably remain Pakistan's records for a long time to come. These two stalwarts leave behind them a great legacy. They have enriched Pakistan's test cricket like never before; win or lose in the West Indies, the three tests should be a celebration of their services to Pakistan, of their contributions to test cricket, and of the great memories they will leave behind as the curtains close on their grand careers. 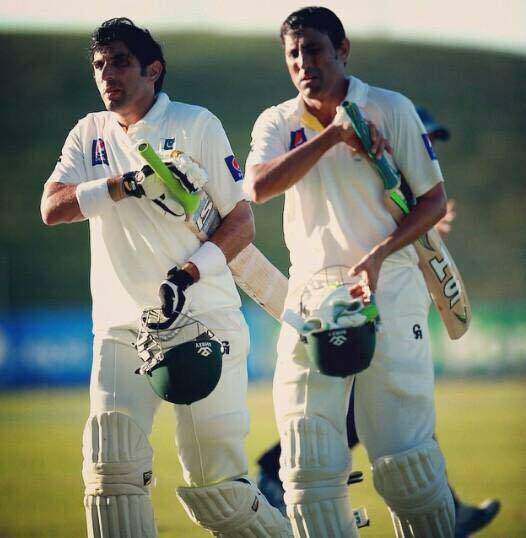 It will be very hard for Pakistan to move on from Younis Khan and Misbah Ul Haq.